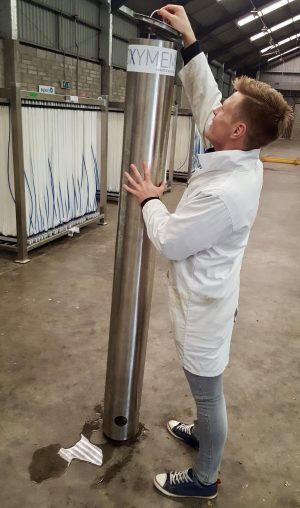 OxyTube provides end users with an opportunity to experience advanced Membrane Aerated Biofilm Reactor (MABR) technology first hand, on your own wastewater facility, with minimal investment. The robust, high quality stainless steel tube is 200mm in diameter and just 2m in length. As a result, it can easily be dropped into a biological tank on your facility. An MABR membrane module containing the heart of the OxyMem technology lies within the outer stainless steel protective layer. This module is fed with air, or enriched air, to ensure oxygen reaches the biofilm when required i.e. once a biofilm has been established. No off-gas or air feedback controls are usually deployed with OxyTube; its purpose is primarily for hands-on experience, not an analytical treatment of the wastewater. A side stream process flow, and thus treatment can be induced by simply removing a small volume of wastewater per minute from the top of the unit, using a small dosing pump. As water is removed from the top surface, the water in the basin equalises hydraulic levels by allowing the same volume of water to enter via its lower opening. Provided with a food source (pollutants in the wastewater stream), and a source of oxygen (air or enriched air) a biofilm will naturally develop on the outer surface of the OxyTube membrane. This biofilm will then proceed to biologically degrade soluble pollutants in the wastewater. End users taking advantage of an OxyTube will experience, first-hand, the growth of biofilm, and can assess the quality and robustness of the OxyMem solution. Depending on a process stream, users may be able to detect a noticeable change in effluent quality (discharge from the top of OxyTube relative to the inlet). 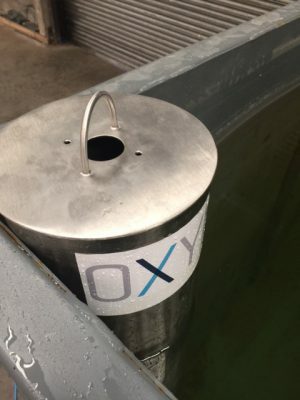 Though a degree of treatment may be recorded, OxyTube should not be used to predict treatability of the wastewater or assist in sizing any larger OxyMem upgrade or new build plant. OxyTube can easily be installed on site within a short time (2 hours), and with minimal effort. It can also be installed quickly into a biological process tank on site e.g. it could hang from a wall or suitable structure so that the top of is just above top water level. Once in position, the membrane cartridge is simply connected up to a small air blower and its power is turned on. Water flow is dictated by the rate at which water is removed from the top of the unit. OxyTube does not need setup assistance and can easily be deployed without the need for specific technical skill or knowledge. OxyTube is manufactured as a cylindrical structure in Stainless Steel, which houses the OxyMem hollow fiber membranes. It contains the fundamental components of process air and scour air systems as seen in the full scale, modular MABR unit.